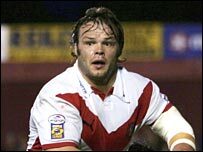 Keiron Cunningham and Jon Wilkin are two of five St Helens players in the 2006 Super League Dream Team. Paul Wellens, Jamie Lyon and Sean Long are also in the star-studded line-up, but there are no representatives from 2005 Super League champions Bradford. A total of seven clubs are represented in the team, with 10 of the 13 players qualified to play for Great Britain. There are six debutants, including prop Danny Nutley and winger Justin Murphy, Super League's top try-scorer in 2006. "It's a good achievement and fantastic to be in a team with this calibre of player," said Castleford captain Nutley, who finished the year as the competition's top tackler as well as the leading metre-maker. "I was pleased with my form but relegation is one thing I didn't want to happen. It hurts. "I knew it was going to be hard, it was everything I expected it to be. You would think 19 points would be all right but it wasn't enough." Nutley, 32, had already decided to return to Australia before Castleford's relegation from the Super League. The former Cronulla and Warrington prop, who was an ever-present for the Tigers in hs one and only season with the club, has signed for the Sydney Roosters. Australian Murphy wins his place in the Dream Team after scoring 26 tries for newcomers Catalans Dragons. Meanwhile, Super League average crowds rose for a fifth successive season to a new high of 9,026 this year. Seven of the 12 clubs reported increased attendances in the regular season, which generated a record aggregate of 1,516,342. The new average is up from 8,887 in 2005 and is the highest for the top league since 1973. Paul Wellens (St Helens); Justin Murphy (Catalans), Jamie Lyon (St Helens), Kirk Yeaman (Hull), David Hodgson (Salford); Danny McGuire (Leeds), Sean Long (St Helens); Stuart Fielden (Wigan), Keiron Cunningham (St Helens), Danny Nutley (Castleford), Gareth Ellis (Leeds), Jon Wilkin (St Helens), Kevin Sinfield (Leeds).